You’ve probably seen it too. Churches splitting over the style of worship songs. One group likes only contemporary, but the other prefers hymns. The newer music increasingly dominates. 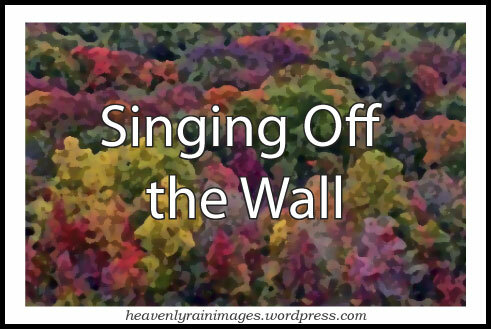 Hymnals are becoming outdated, replaced instead by words projected by PowerPoint on large screens on the walls. A practice my dad appropriately nicknamed, singing off the wall. Some churches try to solve the dispute by having different services for the types of songs. The early am crowd gets traditional and the later rocks to the new. However, are alternate services, based on worship styles preferences, the answer? Don’t they by default lead to division? Sadly, separate worship services rarely fix anything. The partitioned music preferences only widen divisions in local fellowships. What is the solution, then? Do we develop an all or nothing approach, where only one type is used? I don’t have any expert musical training on the matter, just an opinion. But I base it on discussions that I have had with both camps, through casual conversations over the years. Those wanting hymns are mostly the middle-aged to elderly. Even though I knew that already, I discovered something that surprised me. The contemporary camp is quick to elaborate why they think the new is better. They point out that in the newer music, we are singing directly to God; however, in the old hymns, the emphasis is on singing about the Lord. Also, many in the newbie camp are open to the older music, but just prefer changing it to a more contemporary beat, and adding new bridges. Unfortunately, the hymn issue takes us right back to the drawing board in unifying the two groups. I don’t agree with segregating churches into worship style camps. As I mentioned above, I think that it only fuels division. Instead, why not a workable solution that honors both? A blend of both styles, and ideally at every service. For the elderly, try having at least one original hymn and keep it as written. If there still is an avenue of providing hymnals, have these songs sung from a page number out of a book, and not off the wall! This may seem like appeasement toward one disgruntled group, but there are certainly Scriptural grounds for honoring our elders. Besides, there is a generation of young people desperately in need of the truths found in the hymns. Another option is to have regular times of highlighting the elderly singing solos and/or playing hymns during the services. There is something so moving about hearing an aging member passionately sing an original hymn. We also cannot discard the contemporary. To disregard the new music is like telling God that He no longer inspires. Even the hymns were controversial when first written. We must allow for the new. Churches that completely dismiss them are in error, and they typically do so at the sacrifice of their youth. The bottom line is balance. Out of love, we should consider the needs of each group. There will never be a way to please everyone, but letting love be the guiding principle with any issue is always a win. I like both styles. I grew up with hymns, but do have a fondness for the new. However, I agree with my dad. I don’t think I’ll ever get used to singing off the wall. I’d love to know ~ what’s your take on the issue? This entry was posted in Random Thoughts and tagged balance, Church, Contemporary worship music, debate, hymn, Lord, Music, Singing on November 13, 2013 by heavenlyraindrops. Sue, I wholeheartedly agree with your thoughtful approach to this subject. Sadly, our church is one of those with two services. The early service is contemporary, and the second is traditional. I love the idea of meeting in the middle. Variety in music is good. Still think it’s sad that the literal hymn book has disappeared … have a few at home and love them. I find them very inspiring … but I also really like some of today’s praise … not that many though. We have both in our little fellowship. I agree about the hymnals. How wonderful that your fellowship has both. We attend a very large church but used to go to a small one. The fellowship is so often very sweet in small congregations. Thanks for sharing. Hi Sue, we have a choice to sing off the wall or from the words written in the church Sunday program handout, or from the hymn book. The page number is given if the hymn is in the hymnal. The contemporary worship team chooses a few short praise songs and there is a hymn sung with organ. Every several weeks the youth do the entire Sunday service and bring out their drum set; once a month the English-speaking and Chinese-speaking congregations have a joint Sunday worship with some interpretation into Chinese, but most on the wall, though scriptures are read in both English and Chinese. The singing is real interesting; we alternate singing in English and in Chinese; we often sing different lyrics to the tunes of old hymns! Some people think the joint services are too long and skip out. Most of the English-speaking youth have long gone off to who knows where, but the immigrant group is growing with many high school and college youth. I play ukulele with a group that plays in church on special Sundays; we have a formal choir on some Sundays that sings in the choir loft of our 130+ years old denominational church. Somehow we seem to have adequate variety and we have a pastor with music background and tremendous tenor voice who can also lead in hymns with his powerful voice. But we can do more to ‘loosen up’ from following staid church form and tradition, liturgical calendar and such. And unfortunately some like myself are 3rd generation so have little in common with the immigrants because of a communication barrier. That makes church activities like craft fairs and special holiday events the only time the groups actually ‘mix’, but it’s a contrast of cultures. Wow. Sounds like your leadership has learned to be sensitive to the needs of all and I think that is great. And your church building sounds lovely. I love old church structures! Blessings for sharing. And see the interior with the Ukulele Orchestra playing a Chinese folk song. We have a Hawaiian Chinese pastor. God has a way of meeting us right at the point of our needs. The important thing is unity and it sounds like your church has moved beyond that. Wonderful! Blessings for sharing. I’m with you. I like a mix of both as long as they are filled with truth. We must worship in spirit and in truth. “Let the word of Christ dwell in you richly, teaching and admonishing one another in all wisdom, singing psalms and hymns and spiritual songs, with thankfulness in your hearts to God.” (Col. 3:16). I believe there is a place for songs where we sing directly to The Lord as a prayer to Him, but songs and hymns about God serve to fill our hearts and minds with truth to spur us on in more worship. What I find sad is when people look for a local church solely for the musical style with no regard to the preaching of the Word. In the church where I grew up, we actually had a good mix of old and new because we were acapella, and many people really knew how to sing beautifully. Every week in our Bible classes, our youth minister would teach us some of the new songs that hadn’t yet made it into the hymnals, then before the actual church service began, he would start singing one of these, and youth all over the sanctuary would pick it up. Those songs took me straight to heaven. But some of the older people (who still had the opportunity to sing 6-8 hymns before the service ended) complained that this was “disrespectful”. I never did understand that. I like the idea of a musical tapestry of faith (a phrase I heard in a radio sermon years ago) that connects old and new, young and old. It is beautiful when this happens. I like your thoughts here. I grew up in a church that rarely sang hymns… but they did at times and I love them! I think its tragic that this vivid part of the history of the church is so ignored now and uncelebrated… I also grieve over the conflict in church over worship style. We are called to unity. A balance is my preference, too, but when that is not the case, staying unified is more important. Thanks for sharing, Rene!